LG G3 vs. G Flex 2 vs. Galaxy Note Edge SOT(Screen-On-Time) Battery Test! 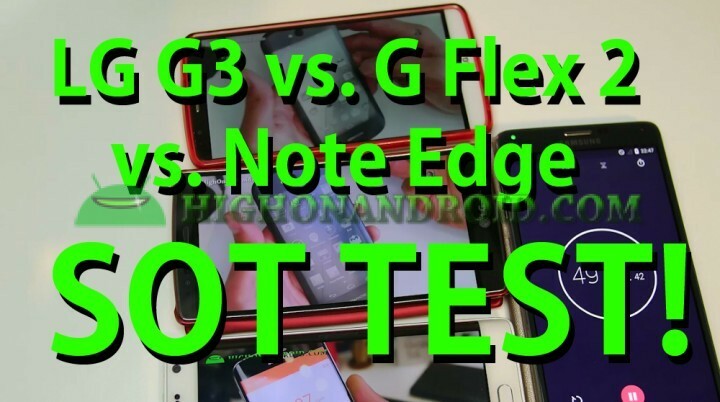 In this HighOnAndroid SOT test, we pit the LG G3 against G Flex 2 and the Galaxy Note Edge. The LG G3 and Note Edge both have 1440P screens while the G Flex 2 has a 1080P screen. Also, the Note Edge sports a Qualcomm Snapdragon 805 processor while the LG G3 sports Snapdragon 801 and the G Flex 2 the Snapdragon 805 processor. As for LG G3, it does fairly well, stopping just short of Galaxy S6’s 5 hour 20 minute mark while the G Flex 2 does a few more minutes than the S6. Overall, the LG G3 and the G Flex 2 fair not too bad but falls behind most of Samsung 2014 and 2015 flagship devices. We definitely look forward to getting HighOnAndroid SOT times of the upcoming LG G4 though, that will be very interesting indeed. Next story HTC One M9 Drop Test with Spigen Case! Previous story Galaxy Note 4 vs. Nexus 6 vs. OnePlus One SOT(Screen-On-Time) Battery Test!